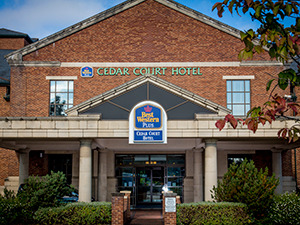 Cedar Court Hotel Leeds / Bradford01274 406606work01274 406600fax HotelLocated right at the heart of the M1/M62 motorway network, Clarion Cedar Court Hotel Leeds/Bradford is in perfect proximity of both these vibrant Yorkshire cities. All bedrooms include en-suite facilities, a welcome refreshment tray, free Wi-Fi, a flat screen television, 24 hour room service, hair dryer, trouser press, and all those essential bespoke bathroom toiletries. A real Yorkshire welcome awaits you in our Oceans Restaurant.Open for breakfast, lunch and dinner the Oceans Restaurant serves a delicious range of modern cuisine. All residents will have access to complimentary car parking and use of the Health Club. Nearby attractions include the National Media Museum, the Alhambra Theatre and within 12 miles you could visit the UNESCO World Heritage town of Saltaire, the home of the Bronte sisters in Haworth, the Keighley & Worth Valley Railway, or shop in Leeds city centre. Leave the M62 at jct 26. Follow the M606 to Bradford city centre. At the top of the M606 follow city centre sign at the roundabout. The hotel is on the immediate right. It is visible from the top of the M606. Follow signs for M606 and M62.